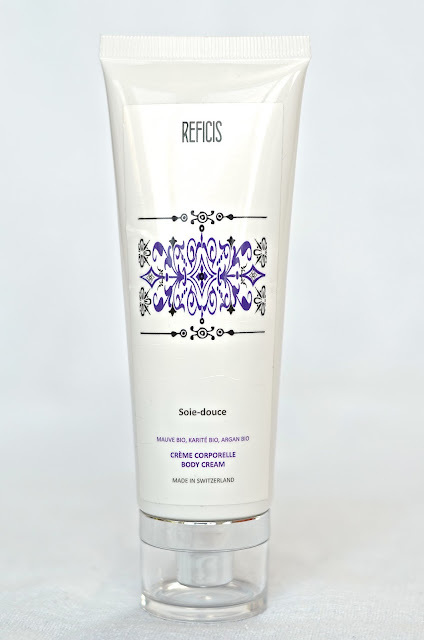 Today I want to talk to you about Reficis’ new line Soie-Douce that was launched on May 22nd. I was lucky enough to attend the launch of the new line and to meet its lovely creator, Marlena. It was such a pleasure to finally meet this energetic young woman who strives to make her dream come true ! What I liked about Marlena’s presentation of these products is that she insisted on all the right things. She emphasised the importance of removing makeup and cleansing (2 different things !) as well as the fact that you don’t necessarily need to use all you products everyday. In case you don’t know, Reficis is a 100% vegan swiss brand. They aim to use as many natural and organic ingredients as possible, their production is artisanal and they include at least 50% of active ingredients (i.e. they don’t fill the bottle with water, the ingredients have a purpose) and 70% for the Soie-douce range. As their products are so concentrated in active ingredients it means that you need to use very little products to see results ! At the launch I received 4 products that I’ve been testing ever since and that I want to talk to you about today. I like the scent of the whole line, the products all smell a bit different but along the same line and it feels very summery. I also really like the packaging of the tubes for some reason, I find it to be quite elegant with the transparent cap. I really like using this cream. It isn’t too thick or sticky and it works really well to moisturise my skin when it feels a bit tight. The consistency is very light and creamy, it almost seems to be injected with air and it melts into the skin effortlessly. It has a delicious smell that’s very summery with hints of coconut oil, among other things. What I don’t like about this product is the price. The tube only contains 100ml (your average tub contains 250ml) of product so you will go through it quite quickly and I definitely couldn’t afford to spend that much on moisturiser regularly. However, if you don’t mind paying the price and are looking for a really good, natural, vegan and organic option then this is for you. It also makes for a very nice treat ! It costs 24.95 CHF for 100ml and you can find it on the Reficis website here. As you may know, I’m a huge fan of the Reficis Efferv’essence purifying cleansing gel (I talked about it here) so I was excited to try their new cleansing gel. What makes it better than the other one is that you can use it to remove eye makeup and it won’t sting. I’m using it more and more often instead of my micellar water to take my makeup off as it is so gentle. All in all, I’d say that the Efferv’essence one is a better option for me as I need to take care of my blemish-prone skin which this one doesn’t do. But it is a great and effective gentle cleanser/makeup remover that will remove your makeup AND cleanse your skin and it’ll be perfect for you if you don’t have (too many) blemishes. The tube contains 100ml and costs 25.- CHF. You can find it on their website, here. To be completely honest, I can’t give you the best review of these products because my skin isn’t particularly dehydrated. However what I can say is that they feel very nice on the skin. The serum works well on oily skin as well as it isn’t too rich and it doesn’t break me out. Also, before leaving for London I applied the mask on my face and I’ve never had such good skin when traveling. I don’t know that it is down to the mask but it probably helped. They both smell really nice. The serum has a light texture that sinks into the skin very quickly and the mask feels very hydrating on the skin and quite rich. They both definitely make my skin feel better but I couldn’t tell you how they perform on severely dehydrated skin. The serum is priced at 79.90 CHF for 50ml (1-2 pump-s is/are enough for the whole face) and the mask is 49.90 also for 50ml. You can find them both on the website, here and here. So that’s it for my review of this new line. Have you tried any of these ? What do you think of vegan, natural and organic products ? L’Oréal Infallible Mega Gloss | From Amazing to Disappointing ?